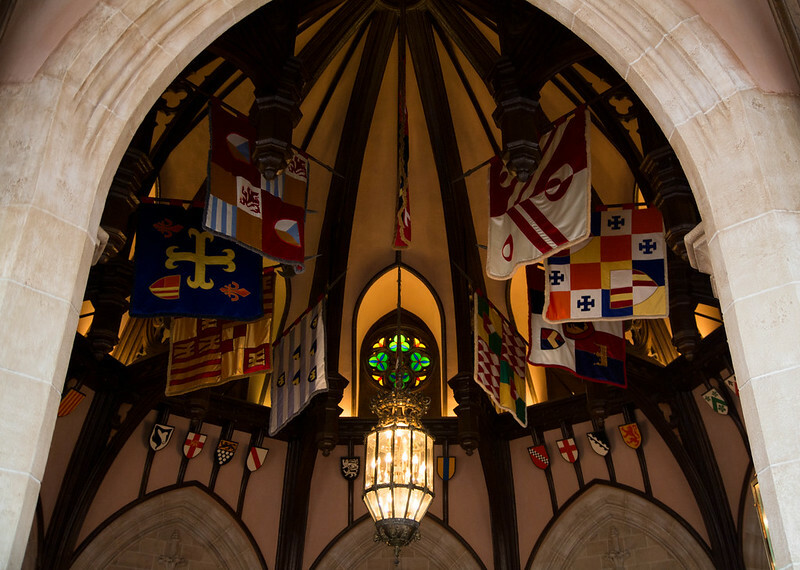 But I had always dreamed of dining in the castle. 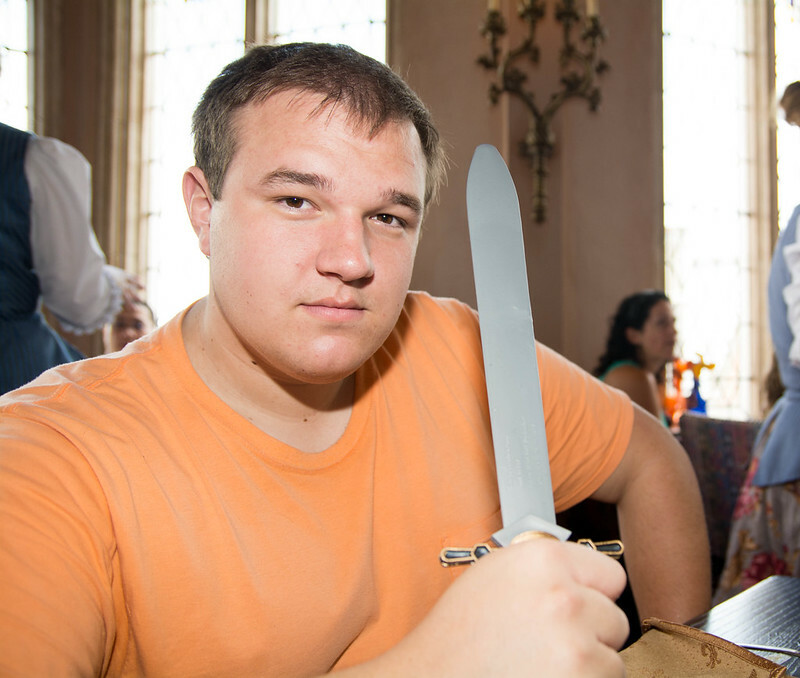 So, I got my first taste of Disney Princesses at Cinderella's Royal Table back in 2009. It was a last-minute 4:30 PM dinner reservation that my Dad scored and surprised us with the day of. At the time, dinner was the meal that did not involve Disney princess greetings, besides Cinderella at the entrance, but only Cinderella's mice. 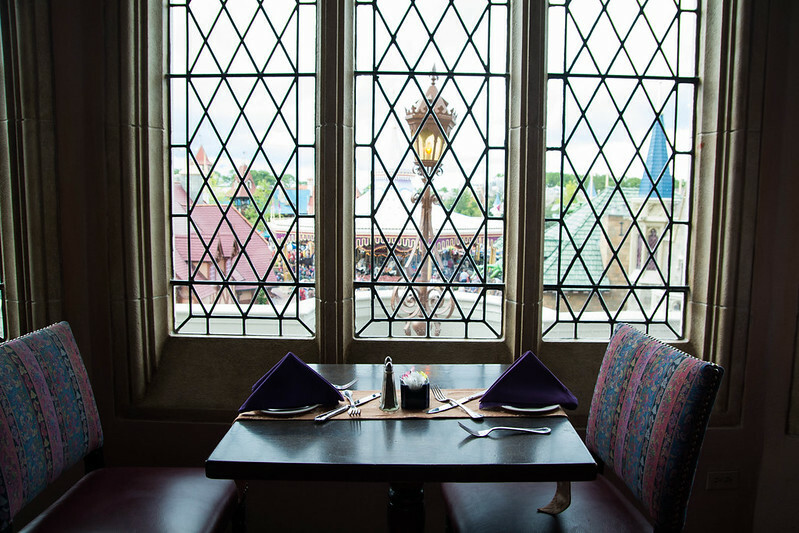 Besides our table next to the window with a view over Magic Kingdom, I remembered dining at Cinderella's Royal Table to be rather underwhelming. 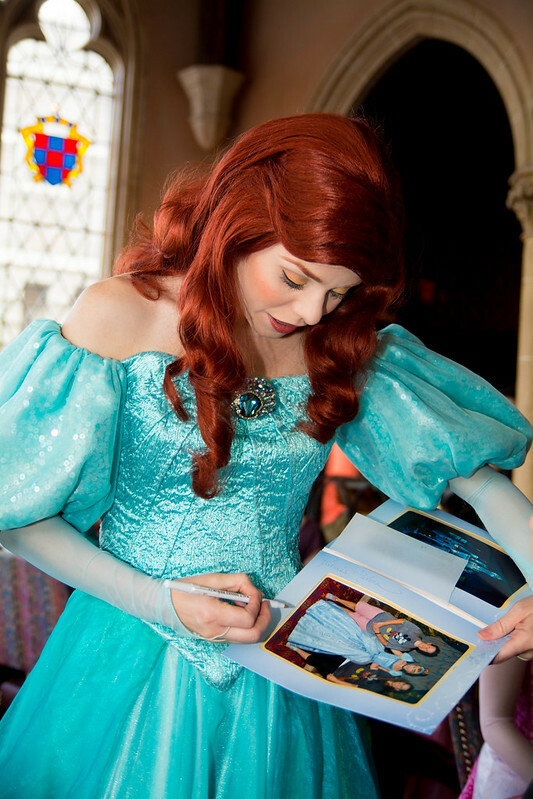 It was something that I decided I would not do again until I had my own children or was visiting with someone who was a princess-fanatic. When visiting Walt Disney World, naturally, I always get cast into the role of tour guide which is something that I enjoy doing. My goal is to make sure that whoever I'm traveling with has an awesome time and falls in love with Disney. But when Max told me that his friend, Natalie, had mentioned dining in Cinderella's Castle to him, I was a bit taken aback. My first thought was that this is a very difficult reservation to get less than 180 days out - what if I can't make this happen? 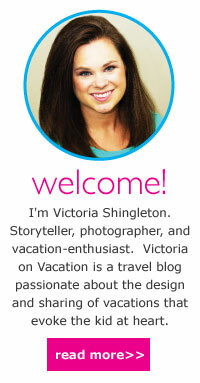 I'm going to look like a terrible Disney tour guide! 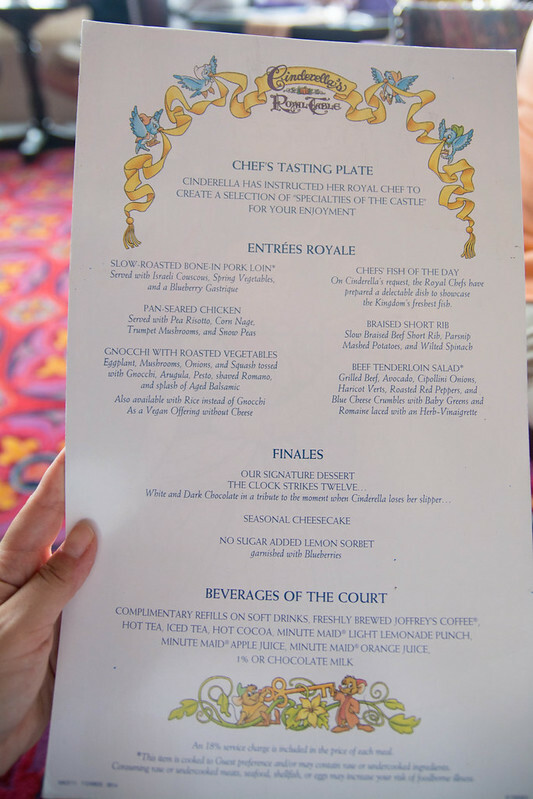 After a few days of persistently searching Disney's Advanced Dining Reservations, a 12:05 PM lunch reservation for Cinderella's Royal Table miraculously opened up. It was actually on the day that we had intended to go to Universal's Islands of Adventure, but when an available reservation opens for Cinderella's Royal Table, one takes it and reschedules everything else. 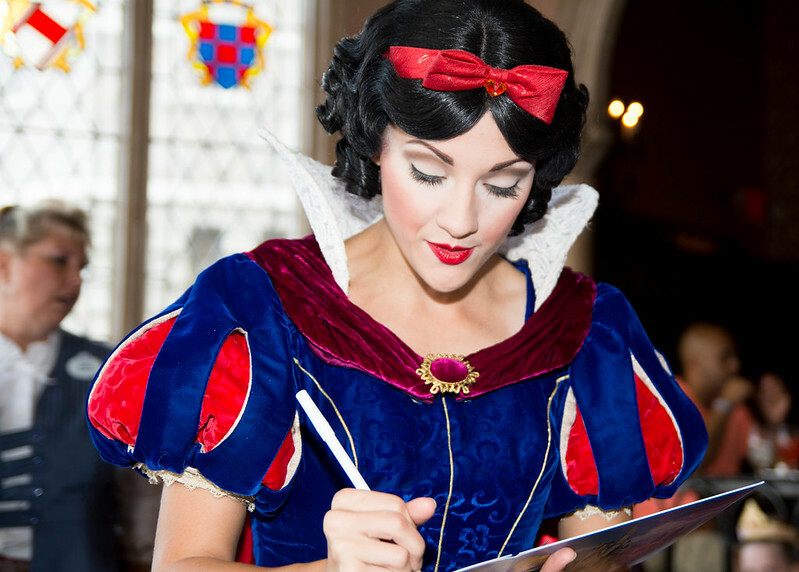 Note that Cinderella's Royal Table is a prepaid reservation. Unless using the Disney Dining Plan, in order to make the reservation you must not only give a credit card number, but pay for 100% of the meal upfront (cancellations can be made up to 48 hours in advance). Even after I had secured the reservation, I had a few worries.... what if the experience was too girly and uncomfortable for Max? What if it was too childish and we looked out of place as a table of four adults and no kids? 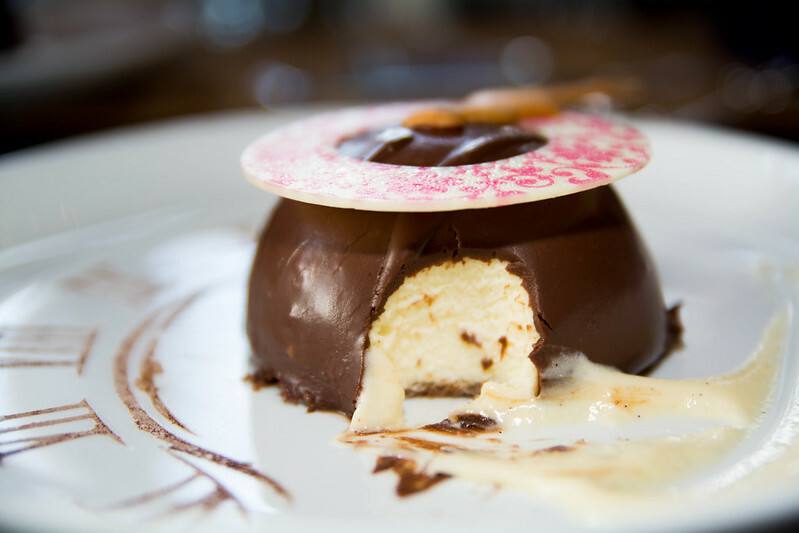 What if the food sucked (I had read plenty of bad reviews online)? 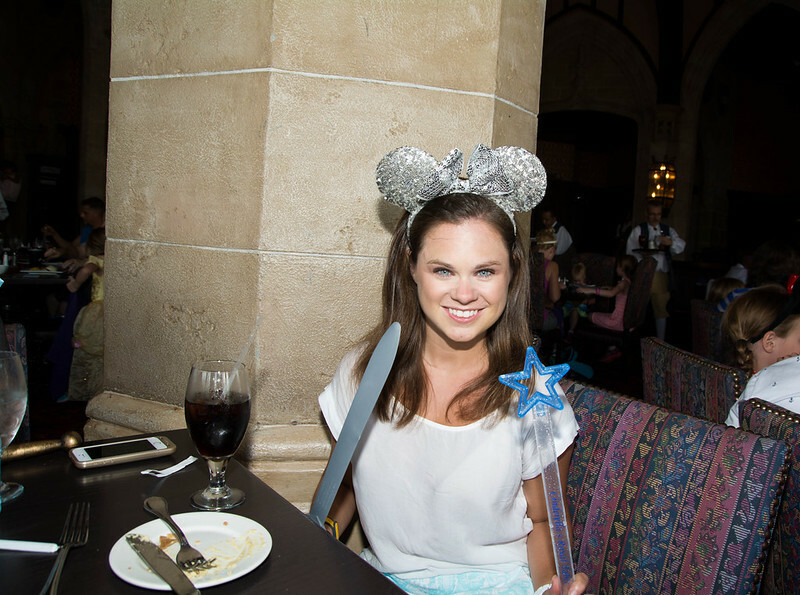 But my success with securing a Cinderella's Royal Table reservation at 30 days out overrode all of my bad dining experience fears. We arrived at Cinderella's Royal Table about 20 minutes early, which is what Disney suggests. I rarely follow that suggestion and typically arrive right on time or perhaps a few minutes late, but since I had already paid for our meal, I wanted to make sure that we did not miss it. When I went to check in, I was told that they weren't checking anyone in, yet, and that we should wait against the wall until they began. 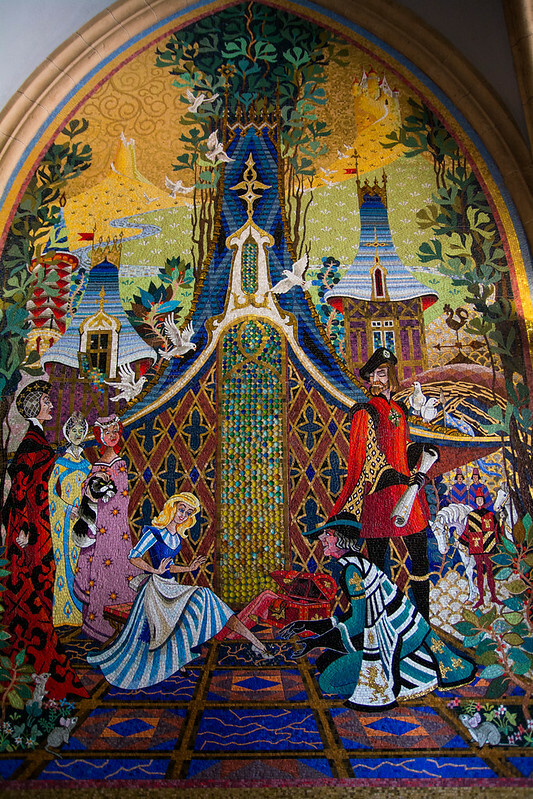 There are beautiful mosaics on the ground level of Cinderella's Castle, and you don't even need to be a guest at the Bippidi Boppidi Boutique or Cinderella's Royal Table to view. If there is not a show taking place on the castle stage, you can actually walk through the castle to enter Fantasyland. If there is a show, you can enter the back of the castle from Fantasyland. 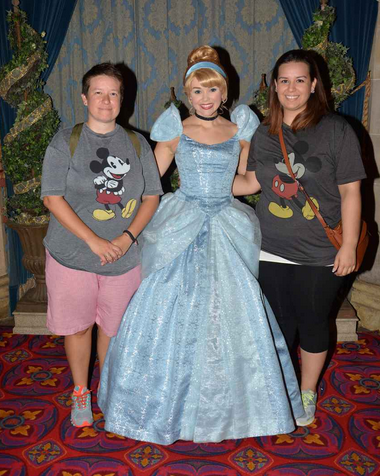 After checking in, we were directed into a line to take a photo with Cinderella. We were told that we got one complimentary set of prints (1-8x10, 2-4x6). After a hot and sweaty morning in the park, Max and I weren't feeling very photo-ready, so we suggested that Natalie and her sister, Rachel, take the print, rather than the four of us. We were then directed up a long spiral staircase. Max remarked how he felt like he was climbing the Leaning Tower of Pisa, and I agree that the rotational movement upward is incredibly similar. After a long journey to the top, we met our hostess. 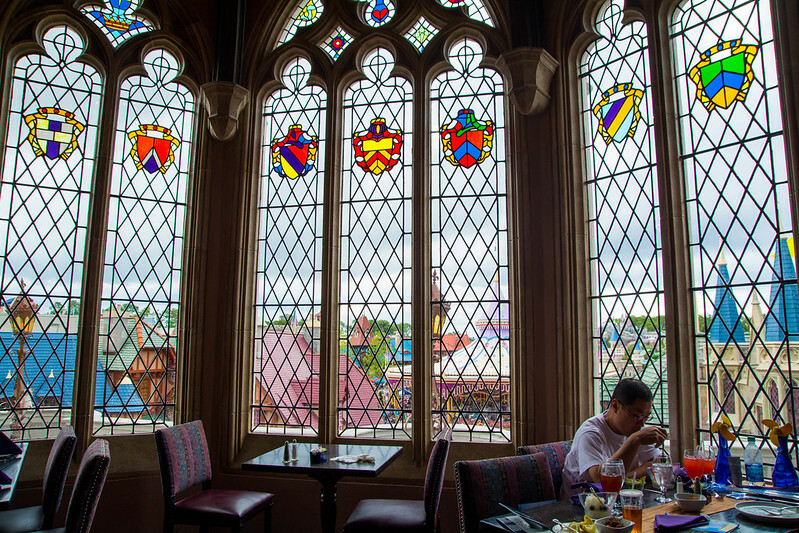 I was excited as she directed us towards the back of the restaurant which overlooks the Magic Kingdom, but she teased us with the empty tables by the window and sat us on the second row. We still had a fine view of the park. The ambiance of Cinderella's Royal Table is not incredibly girly, rut rather has a very regal ambiance. Max even noted that the ceiling was pretty cool. 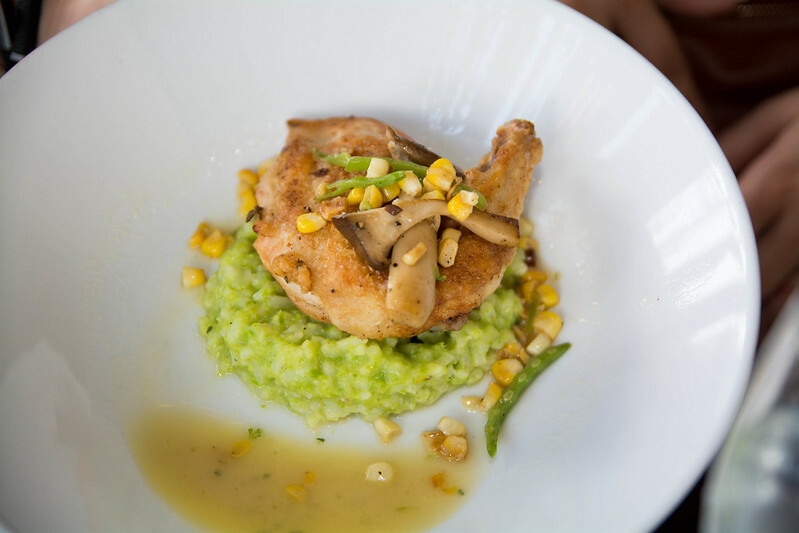 When ordering your beverage, keep in mind that you have pre-paid for this meal. I would suggest opting for soda or lemonade rather than water. 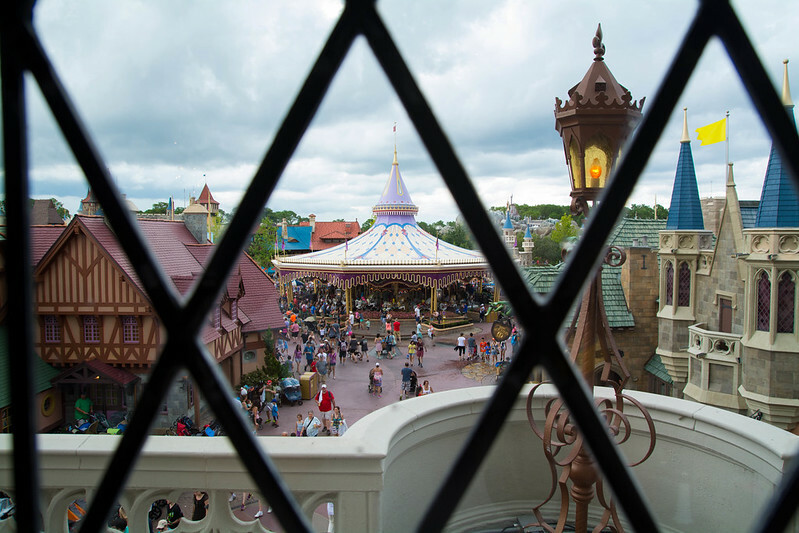 And although Magic Kingdom has begun serving beer and wine at Be Our Guest in New Fantasyland, alcoholic beverages have not yet been added to the menu in Cinderella's Royal Table (and I'm confident there would be an additional charge if they were). 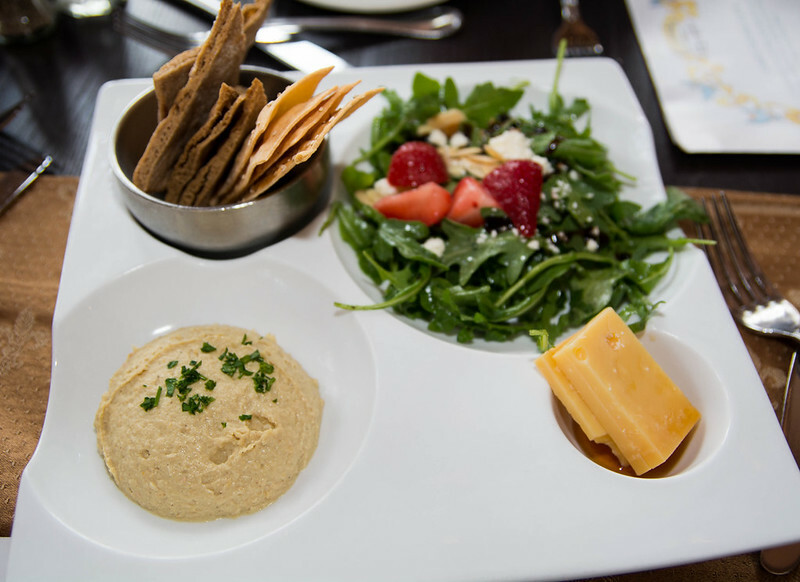 To start, we were brought the Chef's Tasting Plate to share which consisted of hummus and pita crisps, salad, and cheese. Our waitress addressed us as lords and ladies. I couldn't help but giggle a little when she said to Max, "Thank you, my lord." 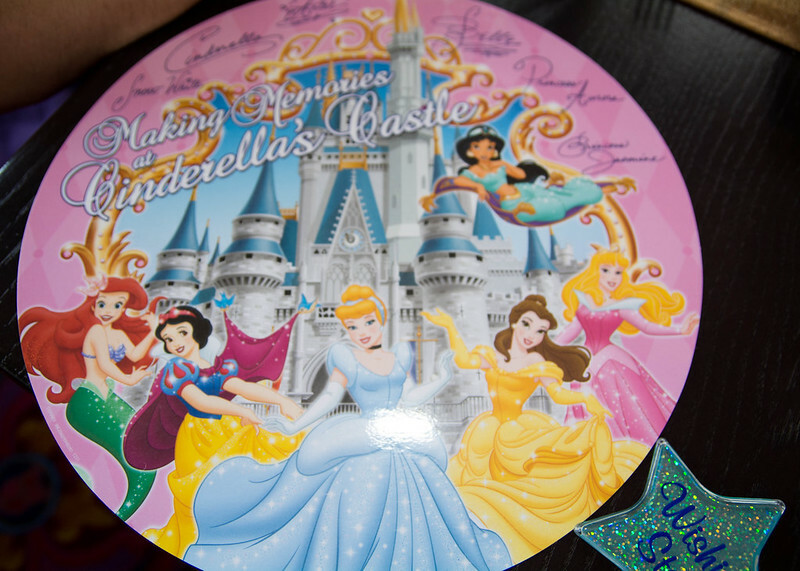 We were celebrating Rachel's birthday, and our waitress brought her a laminated mat signed by all of the princesses. 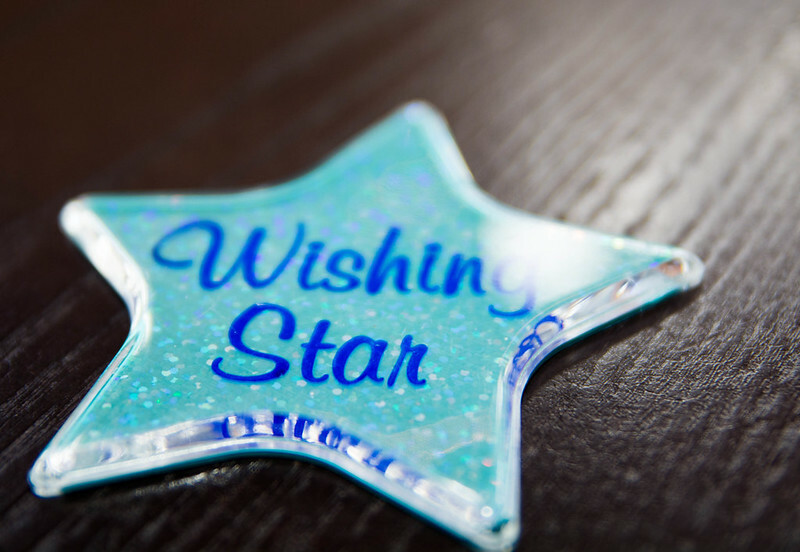 Our waitress also brought us wishing stars. For my entree, I chose the Slow-Roasted Bone-In Pork Loin. I didn't expect much in the way of food and was a little nervous, but I actually enjoyed it. 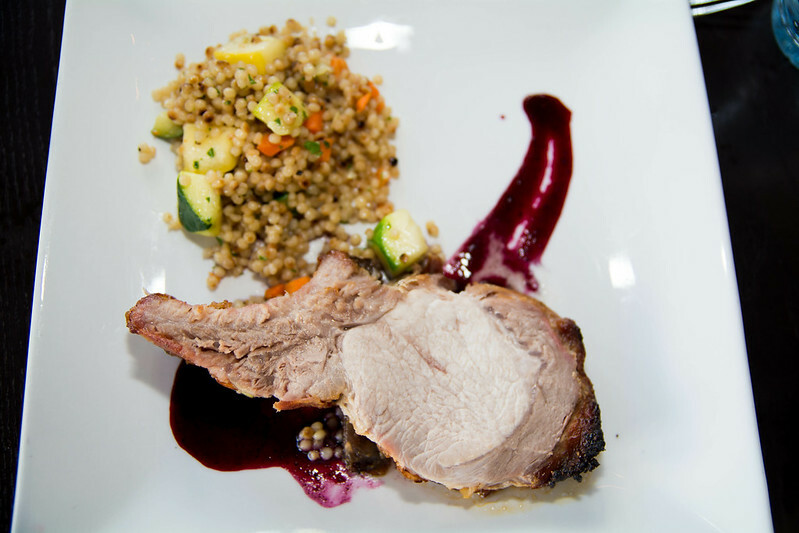 The pork was a little on the dry side, so I was especially appreciative of the Blueberry Gastrique sauce. And I really liked the couscous and spring vegetables. This entree was a little large for me, and I didn't finish the pork. Of all of the entrees at our table, I believe this was the largest portion. 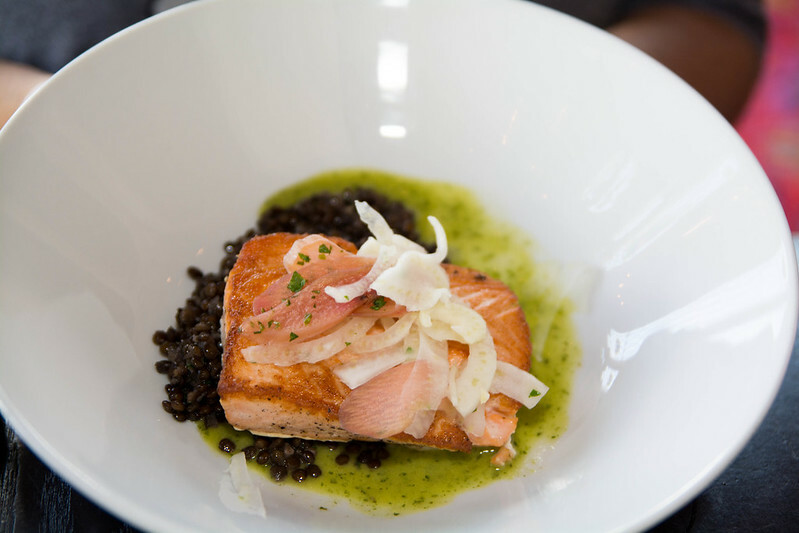 Natalie is a pescatarian and ordered the Chef's Fish of the Day which was salmon. Rachel had the pan-seared chicken. 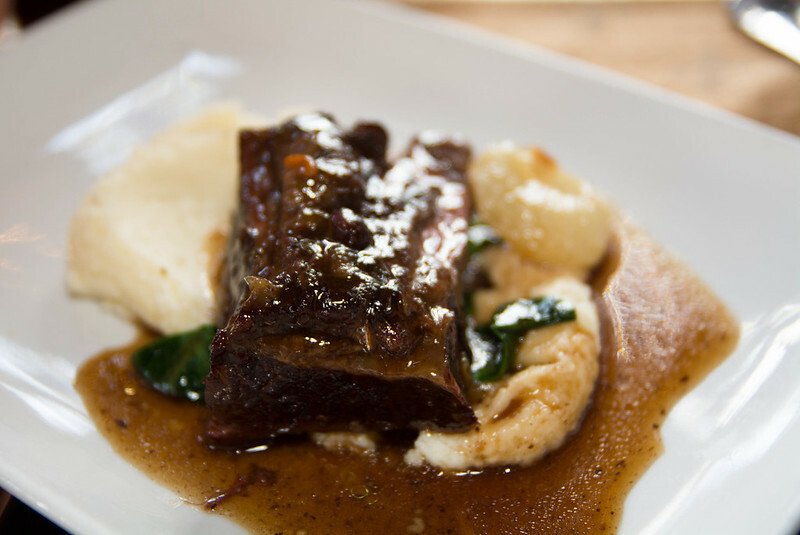 Max ordered the braised short rib, which was our waitress's recommendation. It was delicious. He let me take a bite, and I really enjoyed how tender and flavorful it was. 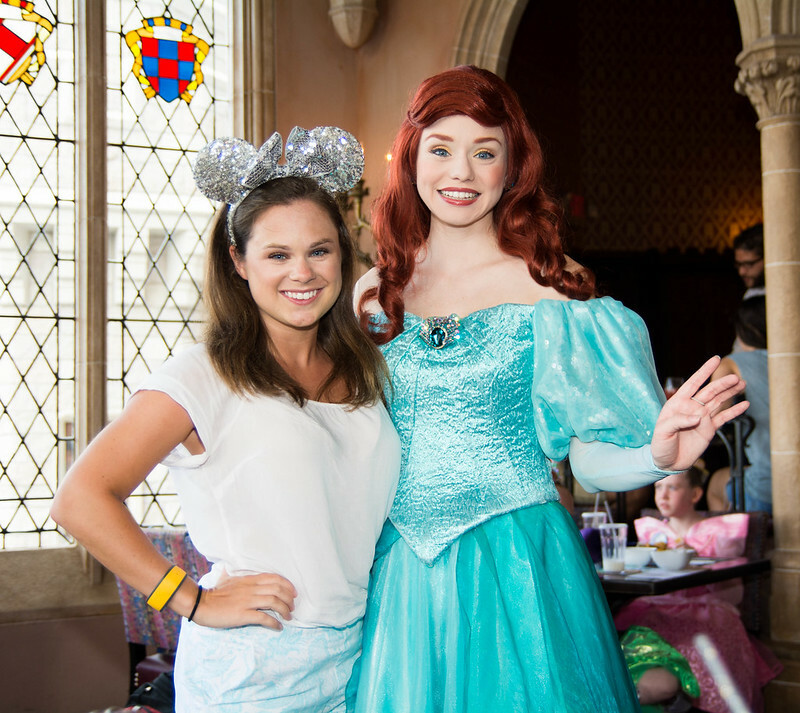 After our entrees were brought out, the princesses began to enter the dining room. Each princess was announced, and a song from her movie played as she entered. 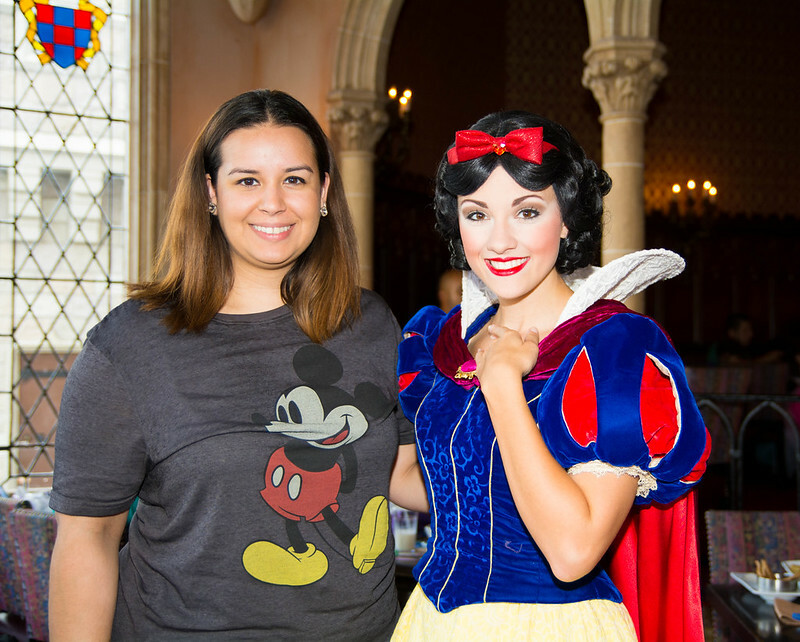 We first met Snow White. Rachel had the princesses sign the frame around the print that came with our meal. None of us had a pen, but she was able to get one from a waitress. 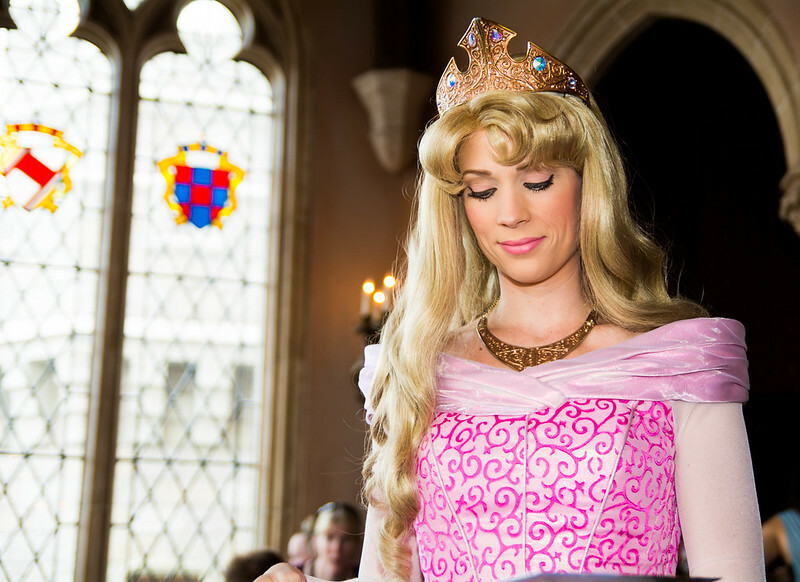 Next came Aurora from Sleeping Beauty. She seemed a little "mature" for the role, and not very excited to be there... maybe she was sleepy. 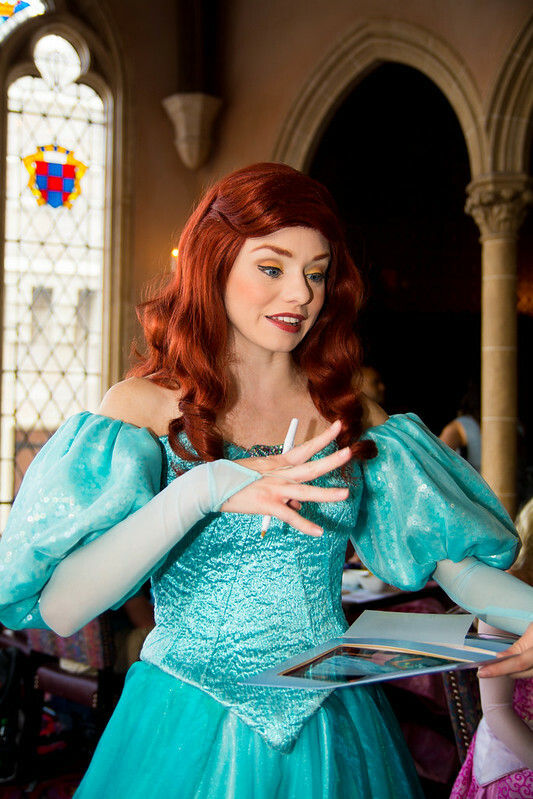 And Ariel from The Little Mermaid who I thought resembled actress Emma Stone, though I'm sure her red hair contributed to that connection. It's her mouth, I think... does anyone else see it? She seemed to be in a bit of a hurry. After taking a photo with Rachel and Natalie, she wanted to move on, but I asked her to take a photo as well, and she agreed. After the photo she physically pushed me forward (it wasn't extremely forceful, but still aggressive) so that she could run back to a table she had already been to and interact with Jasmine. 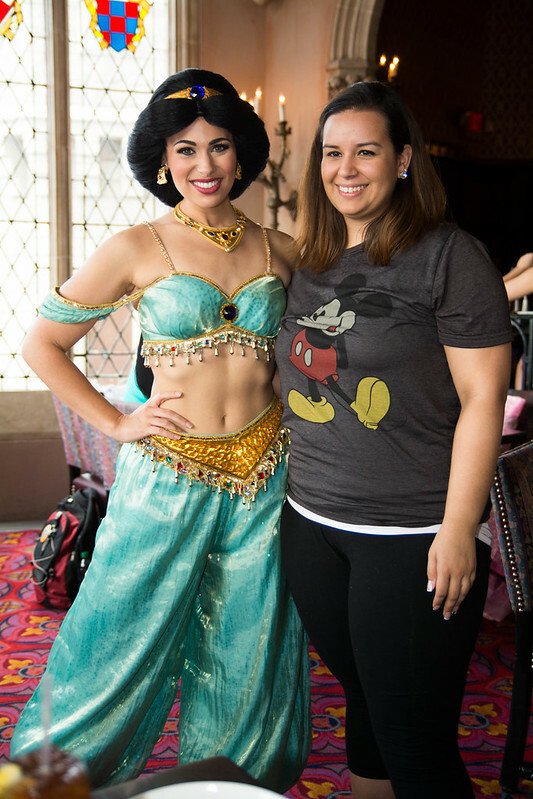 We then met Jasmine from Disney's Aladdin who was my favorite princess we met. She told me that my ears were "shining, shimmering, splendid." Of all of the princesses, she seemed the least rushed - possibly because she was at the end of the rotation. 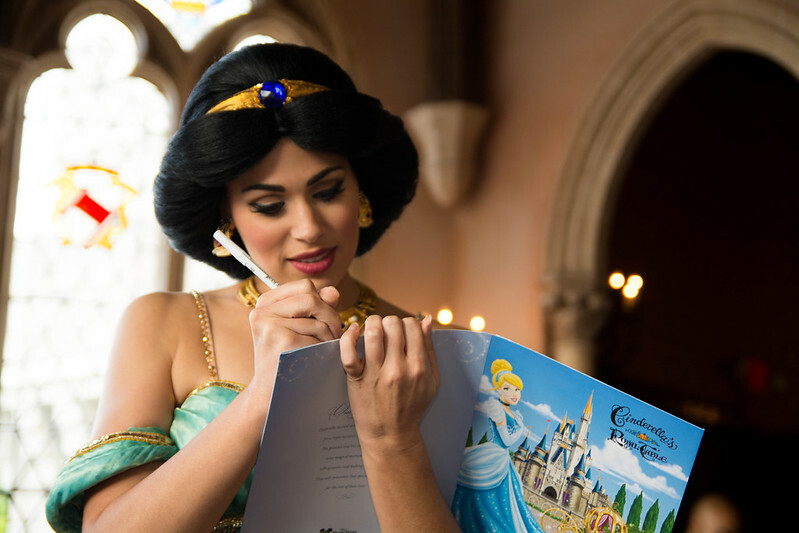 Poor Jasmine has to have her stomach exposed in the dining room while all of the other princesses get to wear corsets. 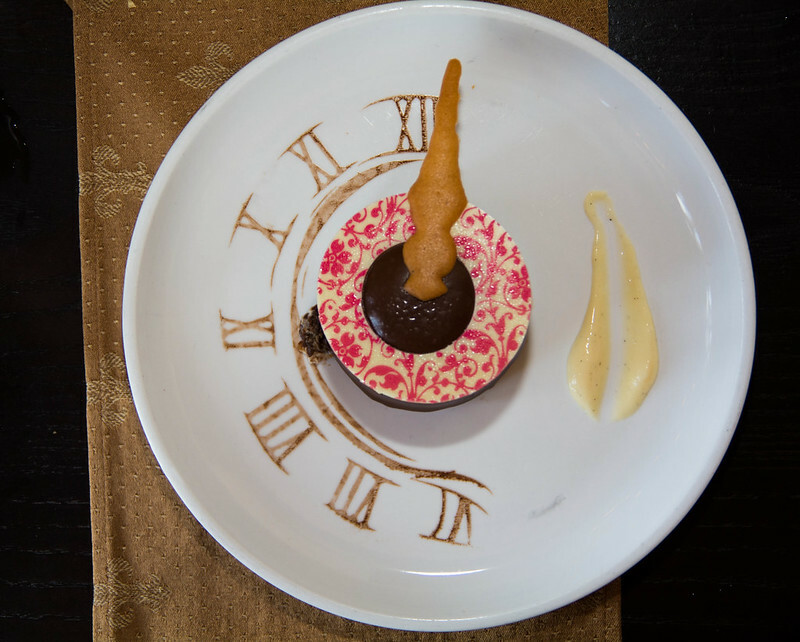 For dessert, we all ordered The Clock Strikes Twelve white and dark chocolate dessert which was adorable and delicious. The presentation is incredibly creative and well-crafted. 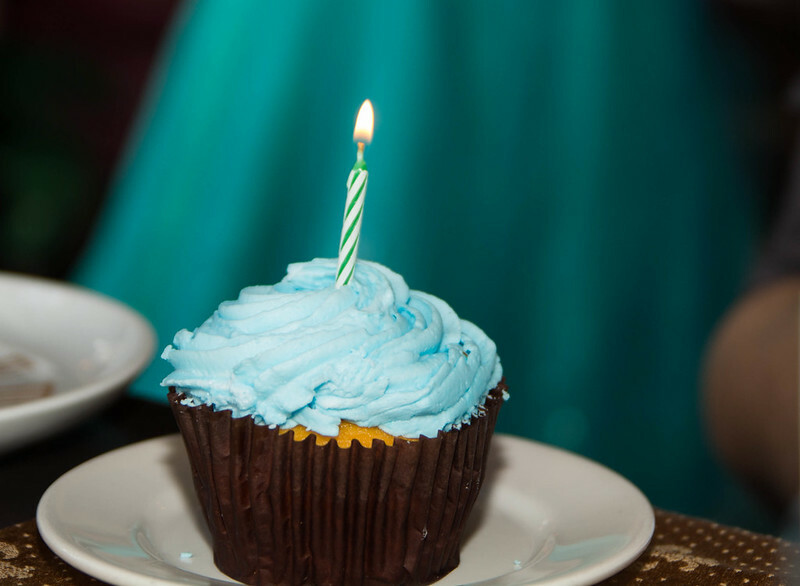 And Rachel was brought a birthday cupcake which she generously cut in fourths and shared with us. I think Disney has really upped their game on the birthday cupcakes because in the past, I remember them being dry and tasteless. Recently, though, I've found the celebration cupcakes to be moist and fresh. At the end of the meal, our waitress asked Max if we were in the Disney Dining Plan or if this was prepaid. I said prepaid. She continued to keep eye contact with Max, and I said prepaid, again. Still, she kept looking at Max, so he said, "Uhh... prepaid," which is when she finally turned and looked at me an said, "Oh, prepaid?" It was weird, but I laughed about it later how our waitress was sexually stereotyping us, assuming that Max must have paid for all of the ladies. 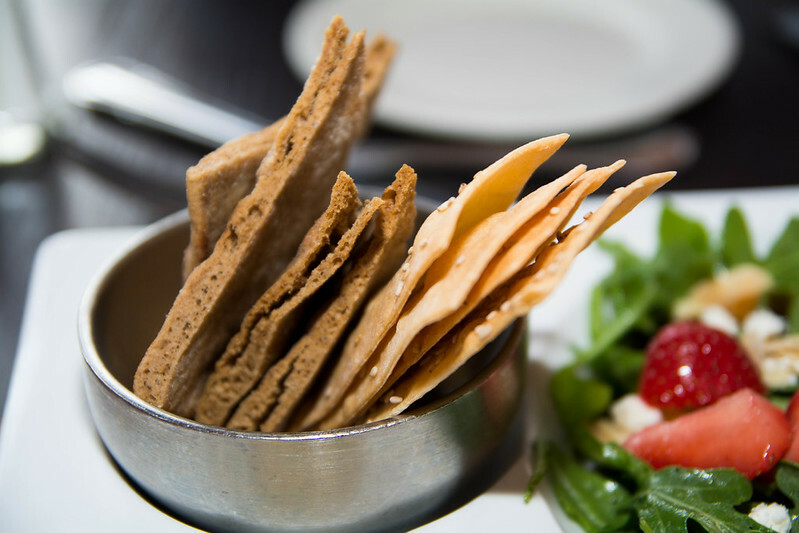 Overall, we were very pleased with and surprised by the excellent quality of food. Going into this, we all knew that the high price was for the experience, rather than the food. 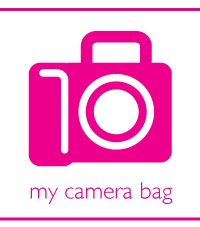 However, this is significant improvement in taste over what I remember having five years ago. As for value, I think Cinderella's Royal Table is still priced more for experience than quality or quantity of food. 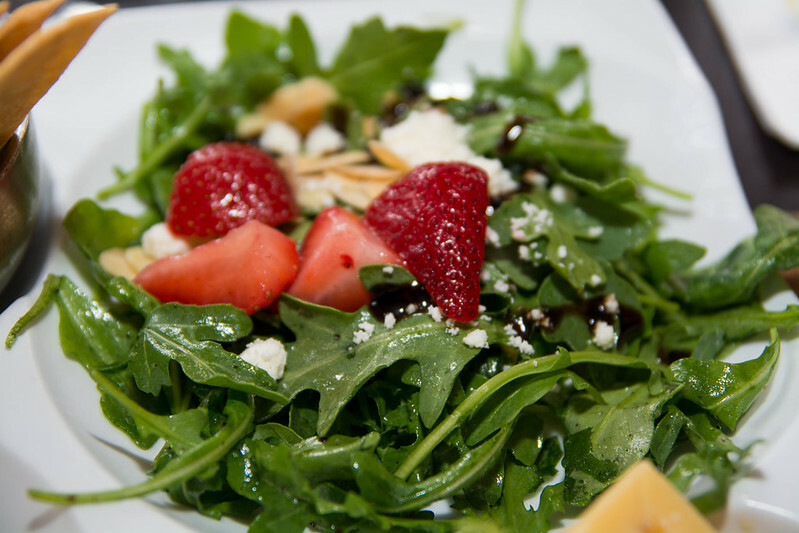 At $60 per person, the menu is extremely limited, and portions are small. But I think that demand is too high for this dining experience to drop in price. Also, I believe that the menu is very much limited by the small kitchen available for this venue, so I don't expect significant improvements in variety to happen anytime in the near future. 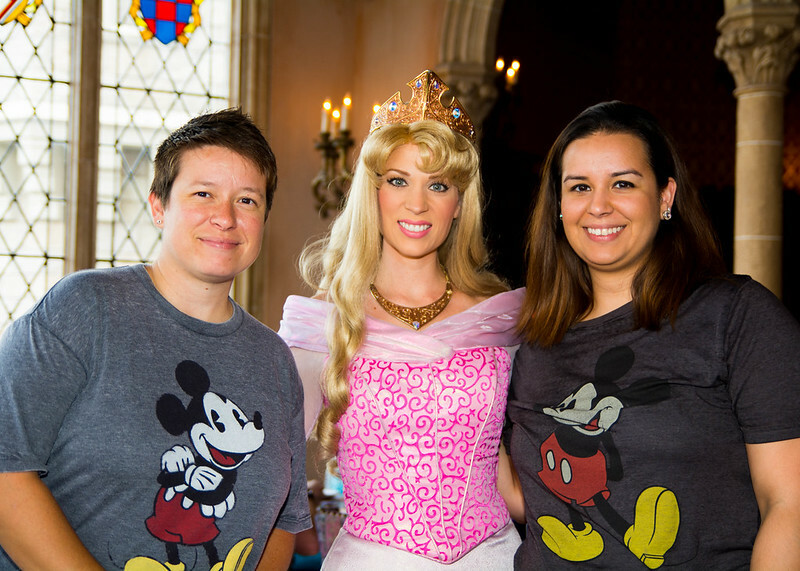 Our experience at Cinderella's Royal Table was very positive. We enjoyed our food, and our waitress gave us great service, despite her tip being prepaid (prepaid gratuity feels a little weird, actually). While I enjoyed our lunch and will return in the future, it's not something that I'm rushing to do again. The reservations are still pretty difficult to get (though the recent opening of Be Our Guest which absolutely must be booked 180 days in advance has taken away a bit of the hype from Cinderella's Royal Table), and a lot of the appeal and value comes with the character interactions which I don't really care too much about. So while my faith is restored in the food, I left with very similar thoughts that I had five years ago... 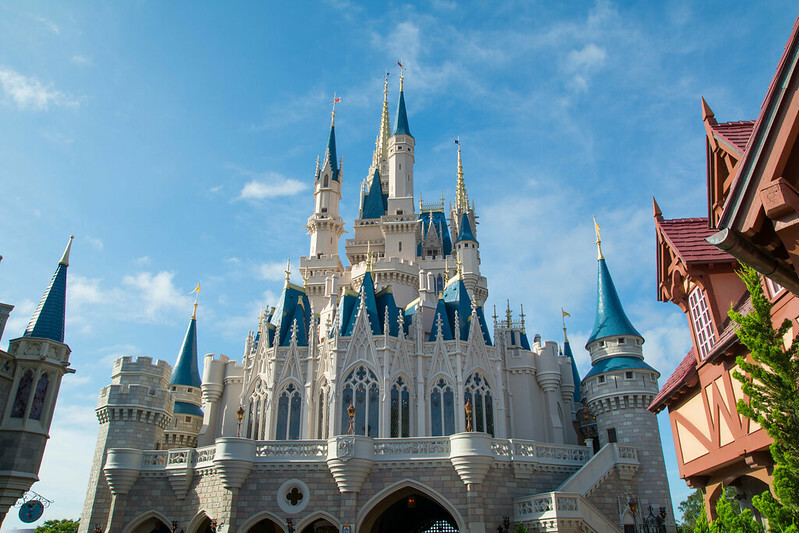 I'll return if accompanied by kids or someone who would like to dine in Cinderella's Castle. 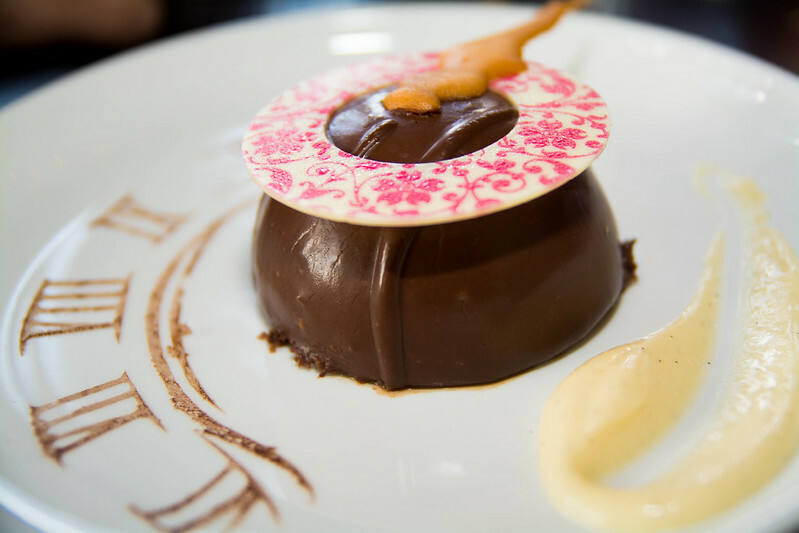 Have you dined at Cinderella's Royal Table? Let me know whether you thought it was a good value in the comments below!